Anytime I can skip take-out and replace it with fresh, healthy ingredients is a huge win for me! Anytime I can do that in less time that it would take to get my order delivered is a double win! No seriously. 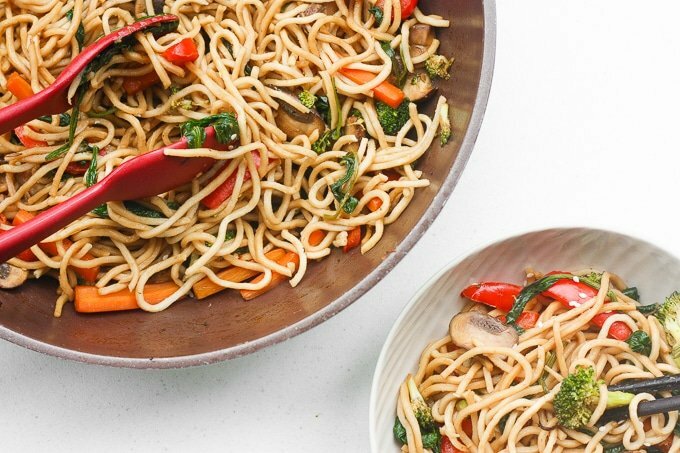 Imagine delicious, vegetable-packed lo mein noodles in less than 15 minutes. Nope, that was not a typo. 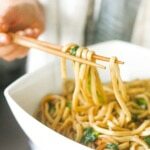 Easy 15-minute lo mein noodles is a no-brainer in our house for an easy weeknight meal. You know, those nights when you have had a long day at the office and cooking dinner is the last thing on your mind. Those nights where you are craving noodles from your local Chinese restaurant. 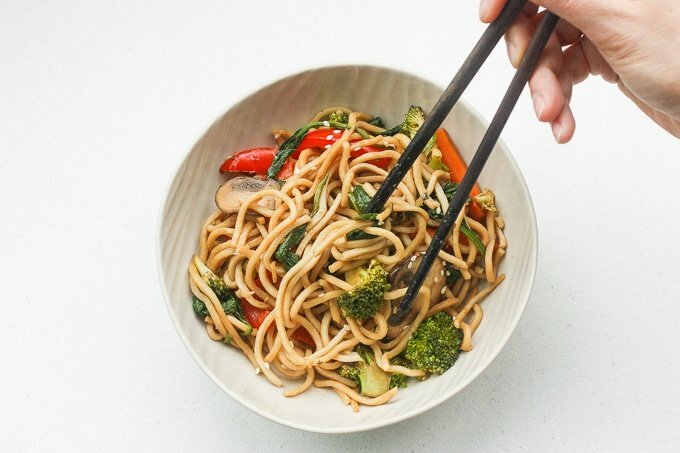 You don’t need to wait 45-minutes for take-out anymore when you can make your own delicious and wholesome lo mein noodles in less than 15 minutes!! 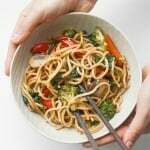 This lo mein is so much better than take-out, not only because it is so quick and easy to whip up, but because it is made using fresh and healthy ingredients. Meaning, no MSG. 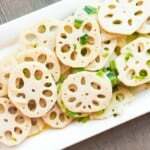 In fact, you could take it to another level and make this dish completely organic by using organic vegetables. 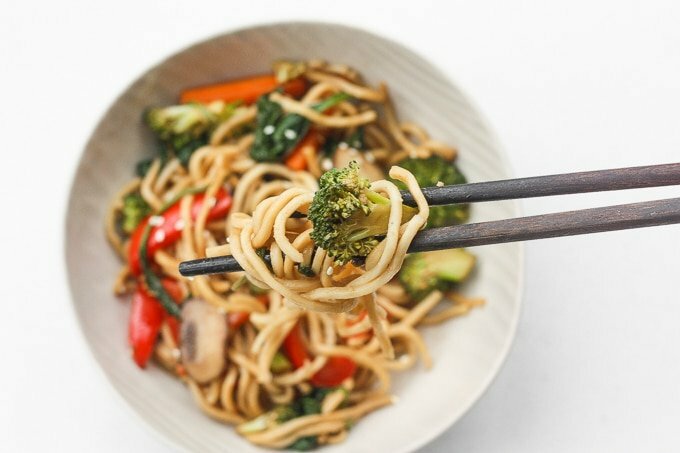 Say goodbye to take-out and make easy 15-minute lo mein at home using fresh and healthy ingredients! In a small bowl, whisk together the soy sauce, mirin, sesame oil, honey, and ginger. Set aside. Cook the noodles according to package instructions, drain, and set aside. Heat sesame oil in a large skillet or wok over medium high heat. Add garlic, mushrooms, broccoli, carrots and bell peppers. Stir fry until slightly tender, about 3 minutes. Stir in the spinach and cook for 2-3 minutes until the spinach has wilted. Stir in the noodles and sauce. Toss to combine. Sprinkle sesame seeds on top and serve. How about adding some protein? For a variation, cook some tofu, chicken, beef or shrimp, set it aside and add it to your noodles at the end. 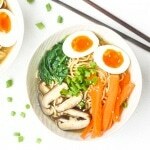 I need more simple, quick, and healthy dinners like this in my life – Looks great! This looks awesome! I just moved to a small-ish town that is lacking in the Chinese take-out department, so I’m on the hunt for great recipes to make at home instead. Looking forward to trying this one out. 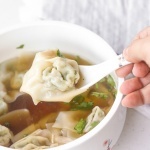 Loving this quick, easy and delicious looking recipe! Thanks for sharing! 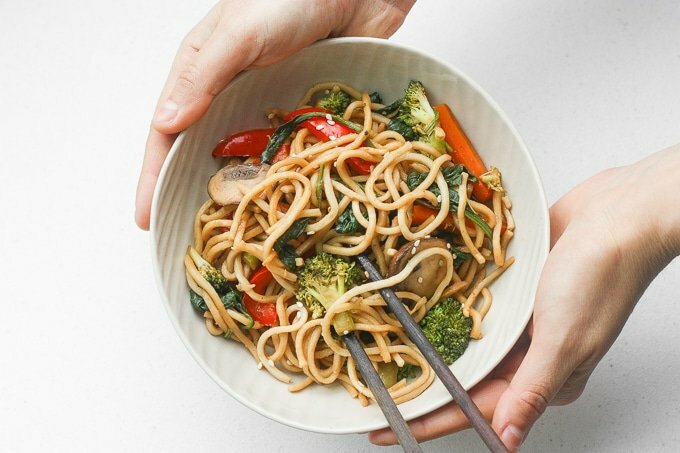 This lo mein looks healthy and delicious. I also love the fact that it’s simple and fast to prepare for a mid week dinner. 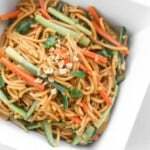 This looks delicious Sam – what a great alternative to takeout, and only 15 minutes! I love lo mein. This version looks so simple and easy. I can’t wait to try it! Any homemade asian food is bound to be delicious! This looks AMAZING! And in only 15 mins! Thanks for this quick, easy and healthy recipe. Great for a busy day meal. Sam, simple but healthy and tasty. I like the colors and texture in this recipe.